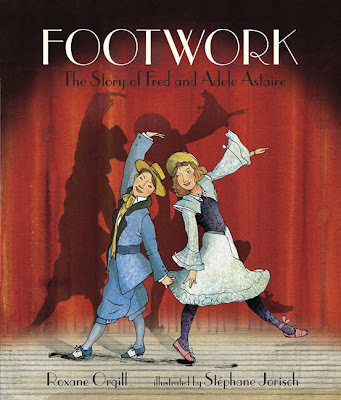 Footwork: The Story of Fred and Adele Astaire is part of the Candlewick Press collection and is a marvelous treat! If the name Fred Astaire has ever delighted or entertained you, you will love this book! Now, I grew up on Classic movies. Loved them! Thoroughly enjoyed musicals and I've devoured quite a few Fred Astaire movies in my (comparatively) short days. I was delighted to discover that there was a picture book about Fred and his sister, Adele. This book documents the story of Fred's younger days when he danced with his sister. We see them grow up and see his sister wander away from the life of the stage. I would say the world benefited from her disinterest in dancing after a time as it eventually put Fred in a position where he was "discovered" for films. The rest, as they say, is history. I know I'm not the only one who loves a good musical and I cannot be the only one who enjoys Fred Astair's creative flair. I simply had to point this book out to my fellow musical-loving fans! This book is a MUST if you have any history with older films and I hope you'll hunt it down and enjoy it. Thanks, Candlewick, for allowing me the pleasure of the read! A picture book about Fred Astaire's childhood? HOW COOL! Thanks for the review as I'm a HUGE fan of his films! How cute!! I never would have thought there would be a book about Fred's childhood. What a wonderful way to introduce Fred Astaire to today's children! The cover art is great!!! Thanks for posting! Cool! I followed your link to Amazon and followed another link of "customers who bought this also buy..." ;) Dangerous when I do that. haha. Anyways, I found an autobiography of Fred Astaire! How cool! I didn't realize he'd written one. That book is going on my to-read list. I didn't know much about his sister until I saw a local musical/play about them last year and it was so wonderful! I love Fred Astaire!! Thanks for sharing ... I also love the classical musicals. I will have to try to track this one down. My favorite Fred Astaire movie is 'Holiday Inn.' Love it! I know absolutely nothing about his life though. How cool to have a picture book about it! In a day and age when you might mention Fred Astaire's name to the next generation and hear, "Who?" this book seems like a gem! I don't watch a LOT of tv, but if I'm up late, AMC is my first channel of choice. A picture book about Fred Astaire? Really?! Oh my!!! I'm putting that on my amazon list RIGHT. NOW!